This lighter uses clear and low-carbon electricity instead of traditional butane, poisonous gas and oil. Flameless: No open fire.Pls be safe! Eco-friendly and energy-saving: cycle use, pls use responsibly. 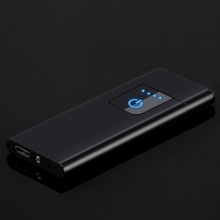 Convenient: You can charge anywhere even by portable power source. Safety: This lighter use high ratio of polymer lithium ion battery which has been tested and has over charge, discharge, overload etc. multiple protection. It can produce electric spark without electric shock hazard to the human body. Rechargeable: It has standard USB socket which allowed to be connected to the USB inerface of computer or any of such ports. LED touch-sensitive switch and battery display, more convenient. Two-sided ignite, easy clean by blowing.